Our society is at war with our artistic culture. In particular, music is fast becoming both an elitist pursuit as well as an artifact, increasingly manipulated for financial gain. The toll of this battle has scene an increase in music teacher dropout at as well as a larger, future generation being deprived of the study of music and, in effect, an examination of themselves. These non-traditional times call for non-traditional measures. That’s where The Music Guerrilla comes in. MG is a boots on the ground, in the trenches method of teaching, connecting with music-makers as well as academic classrooms directly. Clinics and workshops at local, state, national and international conferences. The Music Guerrilla Sessions, bringing professional musicians into school classrooms to both perform and discuss their art in an intimate, interactive setting. This innovative, approach transcends cultural, societal, educational and musical boundaries and in so doing, allows each participant an opportunity to not only grow musically, but to grow as a whole person. Just as innovative is how The Music Guerrilla financially functions: it relies on donations and patronage. Many schools needing services don’t have the funds to bring in an outside perspective. The Music Guerrilla uses all funds from those that can contribute to assist those who can’t! The bottom line: Wage Music. The Music Guerrilla supports music education and artistry of all kinds. Whether it’s a dentist playing guitar in a weekend rock band, the 2nd chair alto sax player in the school band or a homeless bucket drummer, The Music Guerrilla encourages everyone to Wage Music – and in so doing, discover a part of themselves that makes the world a better place. Dr. Milt Allen has worked with hundreds of schools and thousands of students, directors and community members during his career. He is often credited as being one of the most creative, innovative, inspiring and non-traditional music educators today. Conductor, clinician, speaker, author and tireless advocate on behalf of music education, his passion for reaching more musicians at a grass-roots level drove him to leave a 26-year career in education, including 17 years in the public school, to step outside the traditional rehearsal room to create The Music Guerrilla, allowing him – and eventually others – to harness the power of music through whatever avenues available. In so doing, “Doc” is also able to create a means to reach out to programs in need, as well as partnering with music programs in third-world countries. Milt brings a rare perspective to his roles as MG President and Executive Director. His cross-genre music interests effectively combine with previous teaching positions in rural/suburban, large/small and public/parochial environments to create a truly unique ability to connect to those he serves. His experiences range from teaching beginning band in a boiler room to premiering new works at the university level, to working with young African musicians learning to play an instrument. Yet always, from Glasgow, Scotland to Zambia, Africa, and at regional, state, national and international conferences, Milt’s humor, passion and experience combine to illuminate the possibilities of both music and the live art of performance. Milt’s articles and insights have appeared in music, parenting and educational magazines as well as various newspapers, including the San Francisco Chronicle, the Los Angels Times and the Chicago Tribune. He is also the author of Music, Artistry, and Education: A Journey Towards Musical Growth and Enlightenment, published by Meredith Music Publications/Hal Leonard. Dr. Allen’s online venture: “Milt’s Music Minute,” continues to gain in popularity, providing quick information and helpful hints for both music directors and parents. Ensembles under Doc’s direction have received numerous awards at local, state and national levels including recognition by the United States Congress for Musical Excellence. He is a two-time high school Teacher of the Year, a Kansas Teacher of the Year Semi-Finalist, and is listed in various Who’s Who publications. Other honors and distinctions include 5 awards from the Ohio State University School of Music recognizing his teaching and service and selection as a Conducting Fellow for the Eastman Wind Ensemble’s 40th Anniversary. 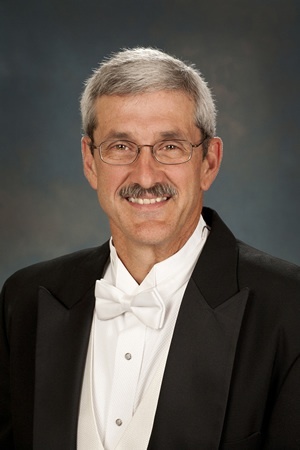 In 2008, Dr. Allen became the first civilian in the history of the United States Air Force to tour as a featured conductor (USAF Heritage of America Band) and received an Eastern Illinois University Achievement and Contribution Award. Dr. Allen is an educational artist for Jupiter Instruments while also serving as a clinician for the Hal Leonard Corporation and Meredith Music Publications. Milt has returned many times, by popular demand, to our county as a conference keynote speaker, teacher workshop clinician, honors band conductor, and school district consultant. He provides valuable and memorable experiences for our students, teachers, and administrators through his engaging presentations, ability to share his vast knowledge and experiences in an approachable and humorous style, while being a passionate and articulate advocate for music education. We will have him return soon – by popular demand!!! In 2015, Dr. Allen came to my school in Unalaska, Alaska, to do a week long residency. The impact he made is still felt here a year later. I still have students who ask me to bring him back here (or as some say, “Tell him to move here!”), students who reference specific things they learned from him, and others who remember his humor. He made immediate, strong connections with all my students, from 1st grade through high school. Many of my high school students told me the final concert we performed with Dr. Allen guest conducting was the best concert they have ever experienced. For myself, as the lone music teacher on an island in the middle of the Bering Sea, Dr. Allen helped bring a revitalizing energy I continue to look at for inspiration. We are hoping to bring him out here again! I have had the opportunity to experience Dr. Milt on 2 occasions. The first was as a guest speaker for Music & Arts several years ago. We had assembled all 90+ educational reps from the company and Milt was the featured speaker. He was outstanding…. knowledgeable, stimulating and funny! My second opportunity was when we sponsored his keynote address at the Illinois Music Educators Convention in January, 2015. Milt was outstanding! I personally knew the current ILMEA President at that time and she stated that Milt was the best presenter she could remember. His knowledge of education, current events within education and his genuine personality and humor were extremely well received. If I am ever in the position again to find a speaker for an event, Milt will be my first call. School Services District Manager for Ohio and Illinois- Music & Arts. Milt is one of my most valued friends and mentors. His humor, humility and human-centered approach to music-making enable him to connect with students and make huge, lasting impact in a very short time period. My students love working with him and I always I learn at least as much as they do. “Doc” is one of our greatest resources as music educators. Dr. Milt Allen is one of the kindest, most sincere and talented teachers/conductors you will ever meet. His vast knowledge and experience along with his passion and hilarious sense of humor make him a magnet for students and an amazing mentor for teachers. Having Milt Allen on our campus was extremely informative, entertaining and helpful. He was able to present incredibly insightful and practical information to our students in an encouraging way that greatly enhanced their educational experience at IWU. His work with our wind ensemble was also much appreciated. I also had the opportunity to spend two weeks with Dr. Allen teaching in Africa. I was so impressed with his energy, knowledge, and the caring attitude he brought to everyone he encountered. His presence was an incredible asset to this experience. I hope we get to do it again! Dr. Allen was the keynote speaker at the Illinois Music Education Conference. His presentation was a highlight of the conference. Milt intersperses thoughtful insight into defining the state of music education with a healthy dose of humor certain to inspire all. Dr. Milt Allen is a brilliant musician, a masterful conductor, and an excellent communicator. His enthusiasm for music translates in every interaction, and the entire process – from first rehearsal to final performance – is enlivening and inspiring.